Baby TV- arguably THE best sleep aid for a one year old! Did I mention that my son does not sleep well? My husband and I have a pretty reliable system to cope with this, originally constructed when our daughter was born and maintained well ever since. We’ve adapted it since I returned to work full-time after E was born but now only work two days. So, I do the night shift Mondays and Tuesdays, he does Wednesday night, then I’m back on for Thursday and Friday while he does Saturday night. Last night, however, we were both grim-faced and bleary-eyed as some kind of tummy-ache demon seemed to have taken our baby at 2am and by 4am he was still screaming the house down! We became a little desperate as all of our usual tricks seemed to be failing. He didn’t want a bottle, he didn’t want to be cuddled, he didn’t want to sit down, stand up or lie in his cot. No stroking my head mum, keep away from me!!! At four thirty I sent P to bed, thinking if he was up any longer I would not get my lie in- I’d been looking forward to that all week! Refusing to keep still or stop screaming, I sat with my son on the sofa and turned on the television. Usually he is so tired that he doesn’t mind me watching Masterchef Australia while he dozes but that’s finished now and so I had to flick… and I landed on Baby TV. Wow. These guys really know what they’re doing. Just as we watched the Teletubbies nad though WTF?? 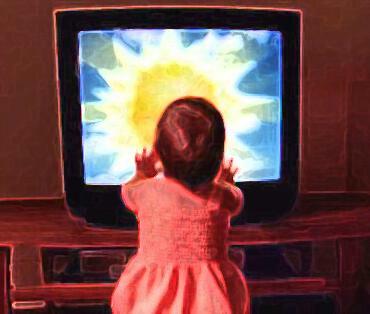 Baby TV at that time is nothing more than shapes and patterns and it feels as though you’re watching a huge lava lamp. I pointed this out to L and immediately he stopped screaming. I invited his little warm body onto my lap and he sat, pointing at the screen. After a moment he was fast asleep and by 5am I was back in bed myself. This morning I eagerly told P all about the power of Baby TV and it got me thinking about the amount of research that must have gone into those simple shapes. Those who market stuff for babies- on the whole- really seem to know what they’re doing. I just hope it works again tonight. Yawn. Next Post Big up the single mummies! oooh i remember baby tv – may need that again soon!